General. 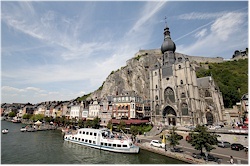 The charming small town of Dinant is squeezed between the rocks and the river Meuse. It stretches along the borders of the river that it decorates with many terraces, restaurants and boats that sail in these beautiful surroundings. The church with its remarkable tower proudly reflects in the water while high on the cliffs, the citadel watches over the town as a shepherd who guards its flock. 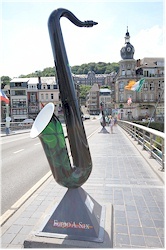 Despite being small, the town of Dinant is the cradle of one of the world's most known musical instruments and the birthplace of its inventor: Adolphe Sax and his saxophone. Other specialties of the town are the "couque de Dinant" and "flamiche". History in short. 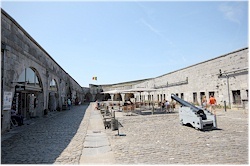 The place where Dinant is located always used to be a place of strategic importance. It shouldn't be a surprise that already in the middle of the 11th century, a castle was built on the spot of the current citadel. The town was known for its coppersmiths, an industry that created great wealth. It was so famous that the produce from Dinant had a specific name: "dinanderie". Commercial and military interests caused that there were often battles for control of the town. 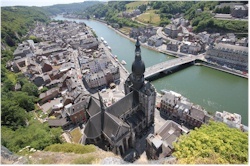 At the time of the Prince-bishopric of Liege (until 1795), Dinant was one of the so-called "Good Towns" of the Prince-bishopric. 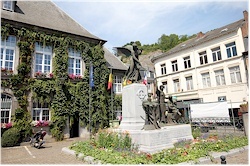 However, the town was located on the border with the rivaling county of Namur. Regularly there were skirmishes with Bouvignes, a town of Namur and located on the other side of the river Meuse. In 1466, Dinant was besieged by an army of the Burgundian duke Philip the Good and Charles the Bold. The town was sacked, inhabitants were murdered or chased out and the relics of Saint Perpetuus were removed from the church. Ironically, the relic shrine was transported to the eternal enemy: Bouvignes... According to history, about 800 inhabitants were tied two-by-two and then thrown into the Meuse river. This meant the end of the successful coppersmith industry. In August 1914, Dinant was again the scene of a slaughter. When the German invader in first instance could not conquer the town, they succeeded in it after all on the 22nd of August. Angered by the delay and out of fear for partisans among the civilian population, a large number of people were shot to death. In the end there were 674 victims. This is known as the Dinant massacre ("le massacre de Dinant"). During the defense of the town, Charles de Gaulle (yes, that Charles de Gaulle) got wounded in his leg. 100 years after the events, on 14th of August 2014, a statue in his honor and to commemorate the bloody events was revealed at the Dinant bridge.